John J. Maalouf, Senior Partner of the Firm, has been ranked as one of the Top 10 International Trade & Finance Lawyers in the US for 2014. 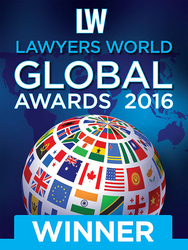 John J. Maalouf, Senior Partner of the Firm, has been ranked as one of the Top 10 International Trade & Finance Lawyers in the US for 2013. John J. Maalouf, Senior Partner of the Firm, has been listed in the Super Lawyers 2013 rankings. John J. Maalouf, Senior Partner of the Firm, Ranked as one of the Top 10 International Trade & Finance Lawyers in the United States. 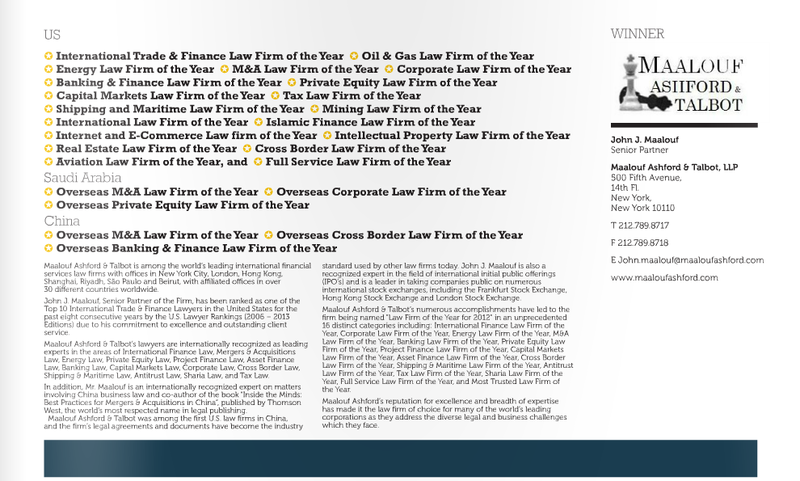 Maalouf Ashford & Talbot, LLP Named "Cross Border Law Firm of the Year" and "Oil & Gas Law Firm of the Year"
Maalouf Ashford & Talbot Named "Cross Border Law Firm of the Year"
Maalouf Ashford & Talbot, LLP named "Advisory Firm of the Year - Asia"
Maalouf Ashford & Talbot, LLP named "Oil & Gas Law Firm of the Year"